Mélaine, the winner of the charity sweepstake, and her father traveled from France to Barcelona to live one of the most intense Spanish nights, the night of the Clásico. She entered the charity sweepstake that Neymar Jr. was running with BidAway, aiming to support the Instituto Projeto Neymar Jr, a foundation focused on inspiring, informing and giving opportunities to more than 2,500 children and families at risk of social exclusion through physical, educational and cultural activities. 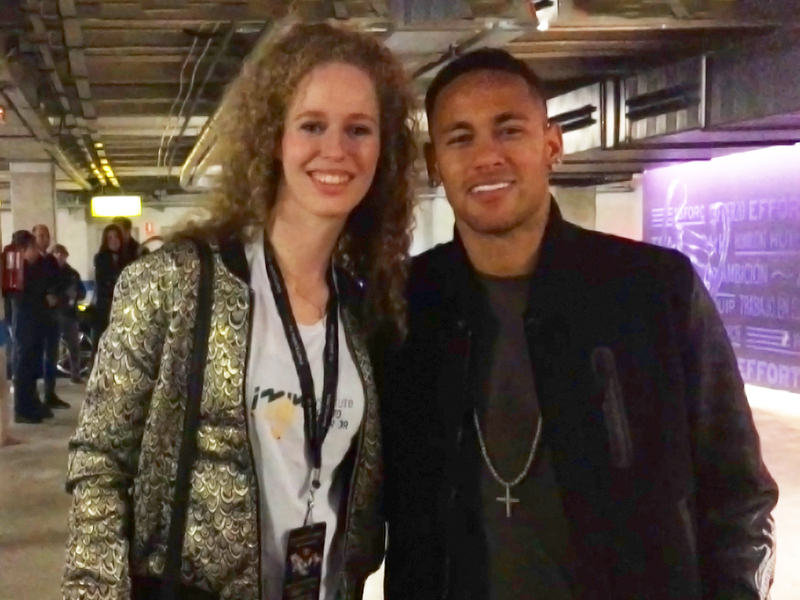 Mélaine and her father rode around Barcelona on a Ferrari and watched the football game from Neymar Jr.’s VIP box at the stadium, where they met his father and other celebs. Finally, the icing on the cake was the amazing time they spent with Neymar Jr. after the game. What is like to be picked up in a Ferrari? "They told me that they would pick me up in a red car; I was expecting all kind of red cars, but definitely not a Ferrari. It was like a baptism for me, because it was the first time I got in a Ferrari, it was a wonderful surprise." How is Neymar Jr. in person? "Neymar is super cool and likable. We took many pictures together, he signed my jersey and we chatted for a while, he was so friendly. If I had the opportunity to repeat this experience, I would without a doubt. Well, in fact, I would like to do it every day." Anything you want to say to the BidAway family? "I hope my donation and the participants’ donations help the children of the Instituto Projeto Neymar Jr, especially to give them hope and make them smile these holidays. I want to thank the whole BidAway team for the work they’ve done, thank you because this day has been simply incredible, I will remember this day for the rest of my life. I also want to thank Neymar for spending some time with me, he was so kind, it was great, and thanks to his family too." Erlebe die Nacht des “El Clásico” und triff Neymar Jr.